D-Link The DI-1705B Router embodies the heart of a small business – low overhead and high return on investment. 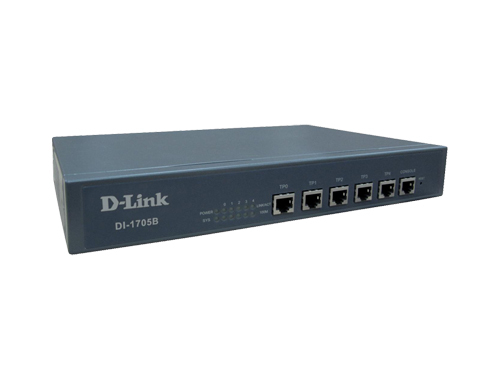 DI-1705B The DI-1705B Router embodies the heart of a small business – low overhead and high return on investment. Multiple WAN Interfaces can be configured in Fail-Over mode to terminate Links from different ISP for providing maximum uptime and reliable network connectivity. Support all mainstream WAN access options, including PPPoE and Ethernet. 5 10/100M Auto MDI/MDX Ethernet ports. These ports are configurable in any (WAN/LAN) port combination based on user requirement. Access control by IP address, protocol, port, MAC address, and time. E.g. Online chatting restriction during working time. "D-Link®, an industry leader in innovative networking solutions, introduces a 5-port routerdesigned for the small business. The DI-1705B broadband Router embodies the heart of a small business – low overhead and high return on investment. Featuring flexible combination of LAN/WAN, this router provides consistent network uptime and reliable Ethernet connectivity. 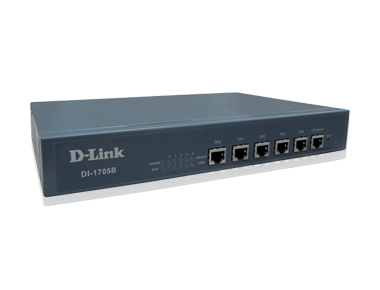 One of the main differentiators the DI-1705B has from most routers is all its ports can be configured as LAN or WAN. With the ability to connect up to four Internet connections from different ISPs, the total available bandwidth multiples in capacity and therefore provides a tremendous increase in network efficiency and user productivity. Multiple WAN ports also provide a fast-acting failover response mechanism; if one Internet connection goes down, the other automatically takes control to ensure continuous network uptime.